Why Buy A Base Porsche Cayman When You Can Get A Lotus For Less? Recently we reported some sad news from Lotus; the Evora is going out of production and this may be the end for Lotus cars in America. Now is your chance to snag one of the most under-appreciated sports cars, before all the collectors decide Evoras are the next big thing. Even More Bad News For Lotus: The Evora Could Be Gone From The U.S.
New Evoras sticker for around $94,000, that isn't a great value when you consider all the other sports cars you can get for the same money. However, since the platform has been unchanged for quite some time, the older cars are almost exactly the same as the new ones. And that, my Jalop friends, is where you can score big. 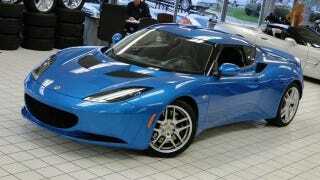 Take for example this gorgeous laser blue 2010 Evora with less than 11k miles for only $49,999. That will get you a 276 horsepower V6 (just forget it came out of a Toyota Camry) mated to a 6-speed manual gearbox, Alpine stereo with navigation (that may have been bought at Best Buy), a backup camera, but most importantly...you get a car that looks like a quarter million dollar exotic and Lotus lightness! O.k. so 3,050 lbs isn't exactly feather-weight but it is less than a 911, yet costs less than a base Cayman. Now the Cayman has 275hp and a starting price of $53,595 with no options. Start checking boxes and that price will climb quickly. You want "Sapphire Blue"? That will be $710. Power seats?...that requires premium package and lighting package for a total of almost $60k. Unlike the Cayman, the Evora has a back seat that is perfectly suited for Chihuahuas, or leg-less mannequins. It is not so great for actual people. Every schmuck who couldn't afford a 911 bought a Cayman. Do you want to be "that guy"? No, you want to be the dude that rolls up to the valet in a Lotus. That valet will say "Hey nice Ferrari bro," and he will park it out front for all to admire because he doesn't know it has a Camry engine. So what if the Evora requires advanced yoga techniques for entry and exit. So what the interior feels like a kit-car. You won't have to liquidate your 401k to change the oil. Of course the other British parts may even out the bullet-proof Toyota power-train, but you only spent 50 large...and you own a Lotus! Now that I think about it...maybe you should just get a Cayman.